My oldest had a Halloween party this evening. I will need to feature the mom who hosted the party in an upcoming post. She had 15 or so 6-year old boys to her home and we all survived to tell the story....there must be something we can all learn from here! 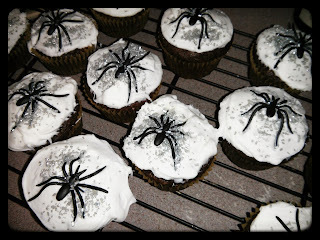 I offered to bring cupcakes to the party. As a working mom I always have a million debates on weeknight events - do I bake it or do I buy it. Many times I will just pick something up so I don't drive myself crazy. But I often bake too and when I do I am reminded that if you have an easy enough recipe the effort to make it can be less than a trip to the store. Plus it is often time more cost effective and usually tastes better too (even if it is from a box!). Get It Done Tip: Have a few easy recipes that you can throw together for weeknight events. One super easy one is Brownie Pizza. For tonight's event I made these adorable cupcakes. I baked the cupcakes last night - took all of 3 minutes to get everything in a bowl to mix it and 18 minutes in the oven. 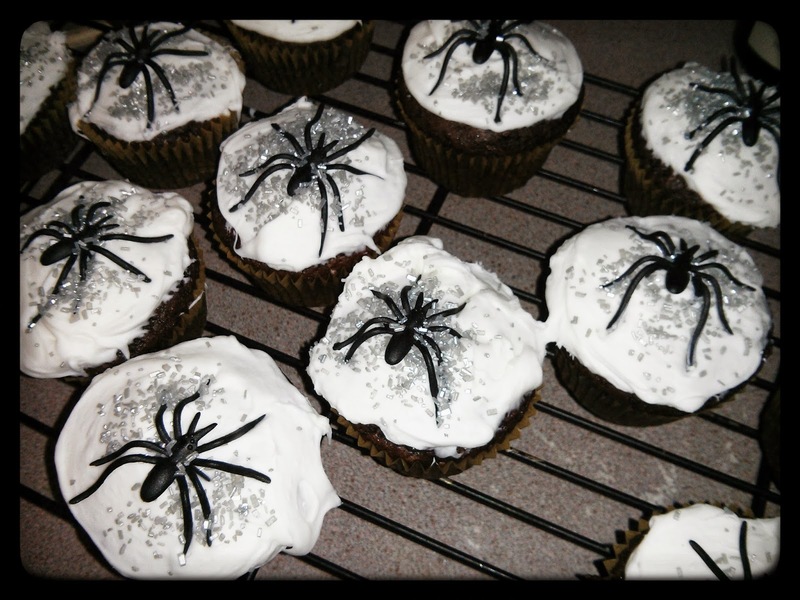 Right before we left I frosted them and decorated them with spider rings and some silver crystal sprinkles. They looked festive and it barely took any effort. My son was so excited I made them which made it all worth it.